Wonderstruck is the new children’s book by Brian Selznick, whose previous novel The Invention of Hugo Cabret, in which Georges Méliès features as a central character, has been filmed as Hugo by Martin Scorsese. In the new novel Selznick (a distant relative of film producers Lewis and David O. Selznick) again brings silent films into his distinctive mix of textual and illustrated narrative. It really began when I was working on “Hugo.” I saw a documentary film called “Through Deaf Eyes” and there were a couple things in it I found particularly interesting. One was an interview with a young deaf man who had been raised in a hearing household and he talked about how it wasn’t until he went away to college and met other deaf people that he realized he was part of this larger community, this larger culture that he had been born into, that was really fascinating to me. There was also a section about the transition from silent movies to sound and how this was a tragedy for the deaf community because with silent movies deaf audiences and hearing audiences could understand the same movies but after the transition to sound, the deaf audiences couldn’t follow the stories anymore. When I finished “Hugo,” I wanted to take what I had learned in terms of telling a story with words and pictures and try to do something new with it. I had the idea to tell two different stories, one with words, one with pictures. In trying to figure out what story would make sense just with pictures, I remembered “Through Deaf Eyes,” and I thought it might be interesting to tell the story of a deaf person in a way that echoes how they experience their own life, so you would get their entire story visually. The plot just kind of grew from there. Through Deaf Eyes is a 2007 PBS documentary, features details of which (including videos clips), can be found on the PBS website. 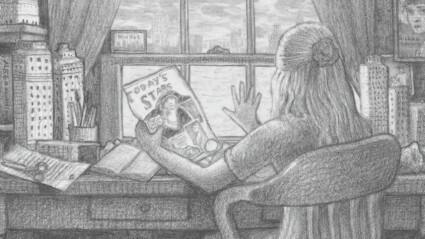 From the illustrations available on the Wonderstruck website it looks to be in the same compelling hand-drawn style as The Invention of Hugo Cabret. Interestingly, the site’s promotional video makes great play with action on different planes, suggesting the 3D influence of Scorsese’s Hugo – they’ll be thinking of the film version already, no doubt. Wonderstruck has just been published, and Hugo is released in cinemas next week. Advance notices have been enthusiastic, and cinemas seem likely to be filled with an unlikely mix of families with children, modern film buffs checking out why Scorsese has gone down such a route, and early film enthusiasts seeing their world recreated with as much historical authenticity as producers Disney may allow. 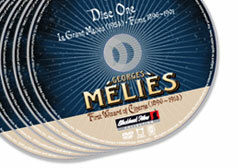 At any rate, Georges Méliès is due to become a name known and his art appreciated by millions of children across the world. How happy he would be. There are clips, downloads, images, background information and much more on the official Hugo site.